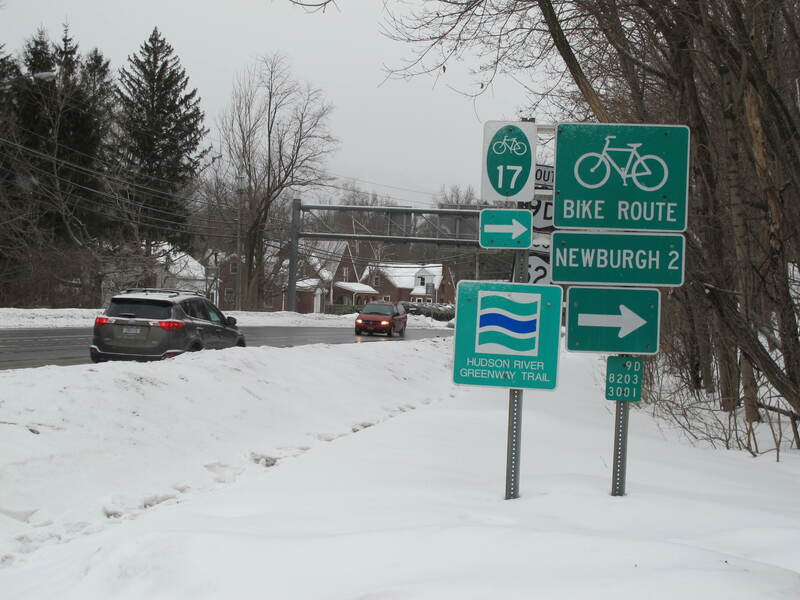 The Newburgh-Beacon Bridge was closed one day this past December with no warning. It was 8:30 on a foggy Monday morning, and I was transporting my son to his bus stop, then heading to work. But when I arrived at the bridge, the gate was locked. The only possible explanation for the cyclist/pedestrian crossing being closed would presumably be the fog. Can someone explain the logic of closing a travel lane where speeds average 3 to 15 mph, with very light traffic and gross vehicle weights under 50 pounds, while directly adjacent you have multiple lanes of traffic doing 50 mph or more, including tractor-trailers, including drivers texting and eating donuts and sipping coffee? It’s the same fog. If it represents a danger to walkers or bicycles traveling at low speed, no doubt it is at least equally dangerous to motorized traffic. It’s not like someone is going to bicycle off the edge—there is a railing provided. The walkway is well lit during its evening hours. To its credit, the Bridge Authority changed the hours of operation last spring, from dawn to dusk to dawn to “2100 hours,” aka 9p.m., a move that Wigwam had been advocating. 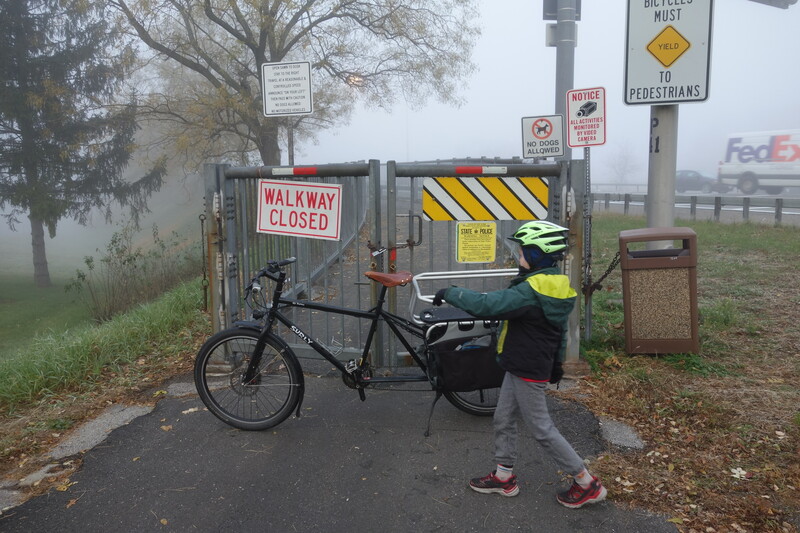 However, arbitrarily closing down the walkway with no notice continues to treat it as simply a recreational path rather than a true alternative transportation option. It really should be very simple: if conditions permit the main roadway to be open, the walkway should be open. This would include snowy and icy weather. While it’s true that many commuters will find other means when there are reports of wintry weather on the way, not everyone has that luxury. 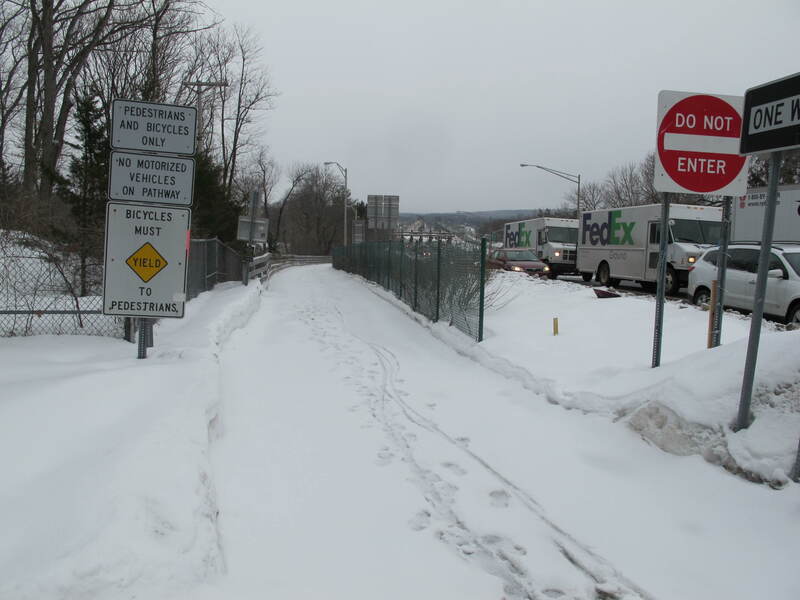 The walkway should be cleared and sanded in a timely manner, just like the roadway. Long after roadways are cleared, and sometimes even after the walkway is addressed, this section remains full of snow and ice. It is never clear what you will find, or which parts of the sidewalks, ramps, or bridgeway will be accessible. One thing is certain, the infrastructure for pedestrians and cyclists is maintained long after the roadways have been cleared. It appears that more than one jurisdiction is responsible for the various sidewalks, ramps, and paths. Sometimes the sidewalk will eventually get plowed, but not the last 50 feet or the rampway. There is also the matter of the approach to the walkway itself. Last year this “on ramp,” an asphalt pathway from the sidewalk on 9D to the bridge walkway gate, was only intermittently and poorly maintained, with large patches of ice remaining throughout the winter, even when the walkway itself had been plowed and sanded. 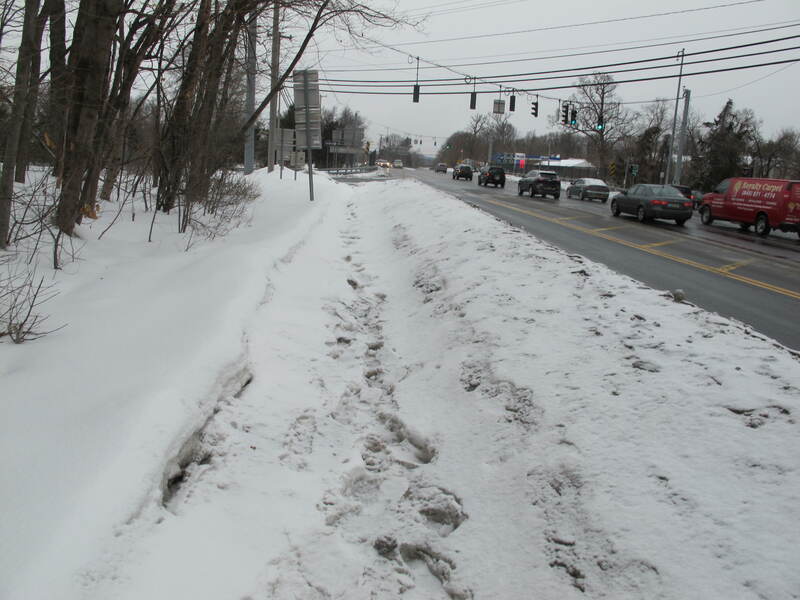 Similarly, the sidewalk along 9D was poorly cleared. 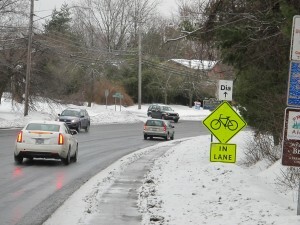 (Although there is a sign alerting motorists that cyclists can occupy the center of the roadway, that particular stretch is often a gauntlet of motorist harassment, from behind and even going in the opposite direction. In wintry conditions, it is generally more prudent to take the sidewalk, perfectly legal on this roadway, though not without its hazards—which is why cyclists are really supposed to be on the road. It also appears to fall under more than one jurisdiction, and sometimes part of it will be cleared while the rest is allowed to languish. 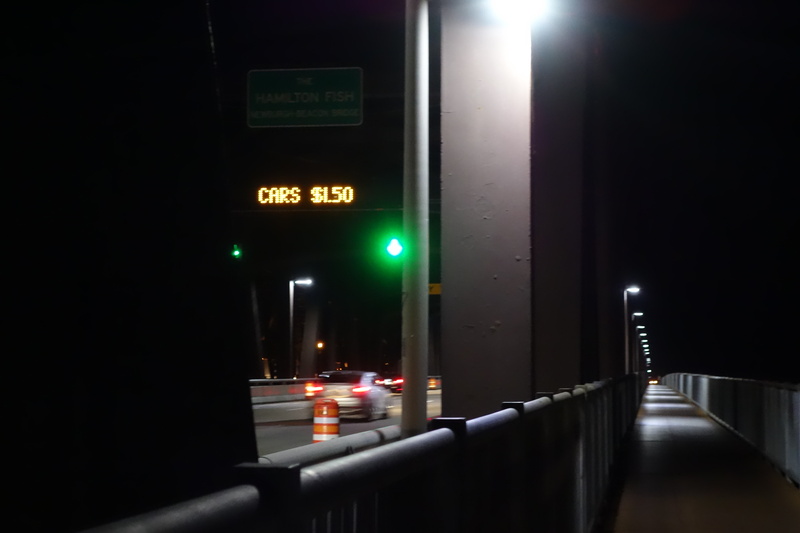 Finally, the Bridge Authority needs to fully commit to the new 9 p.m. closing time (and consider extending it in the summer), by installing updated signage with the new hours and publicizing it in the local media. If the bridge is to help facilitate alternative transport between the cities of Newburgh and Beacon, it needs to be viable, and reliable. How can it grow if commuters are prohibited from crossing without good cause, or the new hours are not posted anywhere? Well I can attest to the fact that the bridge spans are closed quite often due to auto accidents and suicides. Perhaps you would have the misfortune of having to see these tragedies unfold if you Volunteered for the Fire Department or Ambulance Corps. As far as “the fog” you answered your own question regarding safety. If an 80,000 pound tractor trailer crashed into the side of the walkway at even 35 MPH it would easily cause severe injury or death to anyone near it. As far as getting involved you are 100% correct. In these times of terrorist attacks and ongoing threats obviously there is a major security issue if you were able to not only make it onto the walkway undetected but with a bicycle besides! I have placed a call to Joseph Ruggiero, Executive Director of The NYS Bridge Authority. Mr. Ruggiero is very familiar with this area having served multiple terms as Supervisor of Town of Wappingers. Oh and as far as it being a “PRIVILEGE” perhaps you are not aware that it is one of only two walk/bike paths in the entire Country that crosses a Federal Interstate! I’m not sure why it is so hard to understand that, if you are allowing a speeding tractor trailer across in the fog, a bicycle should be allowed to cross. If a tractor trailer bumps into the brand new cement wall that was part of the recently finished $93,000.000 renovations, it will not be going into the walkway, I can assure you. It will bounce right back into the traffic lanes, exactly as the wall is engineered to make it do. Nothing in my post talks about privilege. It is simply giving those who choose to use alternative means of transport the ability to do so. As far as terrorism, there is no way we can eliminate all possibilities, but I don’t think blowing up the Newburgh-Beacon bridge via the walkway is going to be very effective. (By the way, the entire walkway is covered by security cameras. And if you did have such a diabolical plan in mind, would you throw your bike over the fence, or wait until the gate was open and stroll on through?) To eliminate all threats, we would need to stay in bed every day. Of course there are auto accidents on the bridge, with people driving at 50, 60, 70 mph and texting in fog. And yes, sadly, people jump from high places when they are suicidal, and I can understand if the bridge needs to be temporarily closed for an investigation. But none of your points has anything to do with what I have proposed. I have not heard of too many serious cycling or walking accidents on the bridge. Fortunately there have not been many serious injuries on the walkway. In the past 6 years major improvements have been made. The parking lots were added in Newburgh. What used to just be dirt leading to the bridge span is now black topped on both sides. The installation of new lighting and cameras were included in the massive project just completed making it much safer and secure. To address your concerns about the snow/ice hopefully I can give you some information that will be helpful. The area of sidewalk from the welcome to Beacon sign to the overpass corner is owned by the Town of Fishkill. 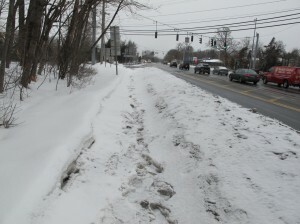 Prior to that certain sections of sidewalk are taken care of by the City of Beacon Highway Department after they finish the roads. The section that the Town of Fishkill may just forget as they are very busy. You would have to contact Their Highway Superintendent Glenn Scofield Sr. He is a true gentleman and I’m sure would do his best to assist. The walkway itself which starts at the edge of the sidewalk on 9D is maintained by the NYS Bridge Authority after all work on the spans and the toll plazas is completed. Unfortunately they have had major cuts to their staffing in recent years. If you visit the NYS Bridge Authority website it has the direct phone number for the toll plaza office and any safety issue should be reported to them. Hopefully this information is helpful so you don’t waste your time having the blame passed around as so often happens. 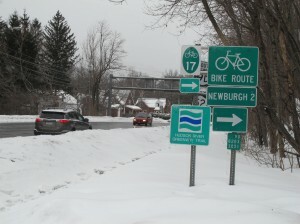 In the spring I am planning to move (from Chicago) to Newburgh, where my bike will be my only transportation, and this (along with the night-time closures) is really demoralizing. I looked into the New York Bridge Authority’s public meeting schedule to see if it would be possible to attend to advocate for the pathway to be open around the clock. If I am interpreting its site correctly, the meetings are held in a highway toll plaza (!) which is not legally accessible except by car. Thanks for your comment, Eli. At least the current policy of staying open until 9pm is better that previously, when it closed at dusk. Then the option becomes the ferry, until the river freezes over. Then it’s putting your bicycle on a bus rack, but accessing those stops can be dicey. Please post another comment with the link to the public meeting site.